Does Acupuncture Needle Hurt? Usually, it does not hurt. Instead, my patients called my needles as happy pins. It’s due to the needles remove their health issues. Meanwhile, give them instant happiness and soothe their emotion. There are so many people afraid of needles. It’s due to vaccine needles caused hurting at a young age. Many people carried this bad experience in their memory without reasoning the relationship to the needle size and their growing up body size. In children’s vaccine shot, the needle used to use 23 gauge or 25 gauge needles. The outer diameter of those needles is 0.635 and 0.508mm respectively (Please refer to “Syringe Needle Gauge Chart” at http://www.sigmaaldrich.com/chemistry/stockroom-reagents/learning-center/technical-library/needle-gauge-chart.html). However, for acupuncture needles used for adult, the most commonly used are 0.20mm or 0.25 mm in diameter or even thinner. It’s far smaller than the vaccine needles and caused less pain. On another hand, as people grow up, the needle size proportional to his/her body relative size is an also lot smaller. Therefore, most of the patients could not feel anything when needles were inserting into their bodies. We used to use acupuncture needles to do preventive health care. It means that we used to use acupuncture needles to avoid people get an injection for his/her sickness. If you still stick “needle is hurting” in your brain without refresh it, you lost preventive healthcare from acupuncture treatments. 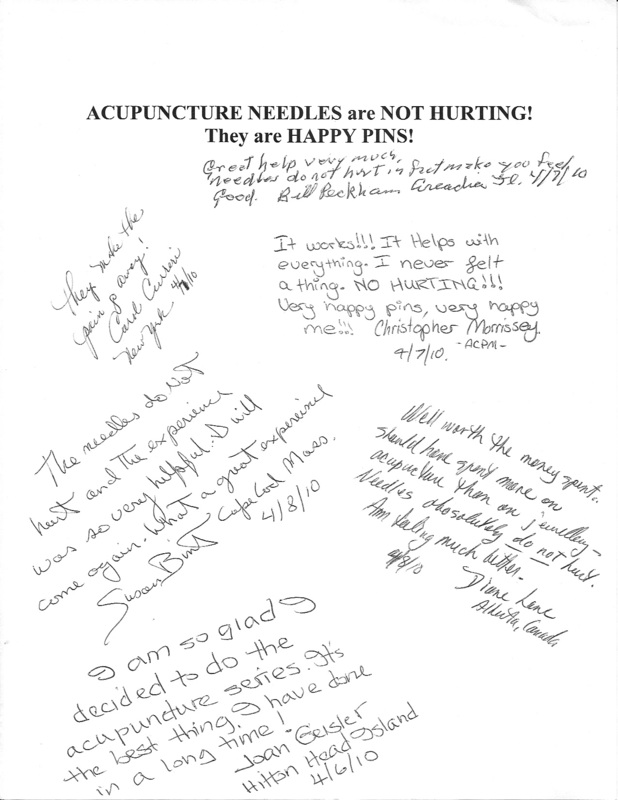 Actually, patients call Frieda’s needles as happy pins due to after inserting happy pins, pain/numbness/ discomfort gone, emotion and body become lighter and feel happier. Acupuncture Needles are Not Hurting!